Systemic lupus erythematosus is a type III hypersensitivity reaction. There will be deposition of the antigen - antibody complexes in the visceral structures capillaries. Systemic lupus erythematosus occur due to auto antibody reaction which lead to destruction of the host cells. Mostly there will be immune complex deposition in the kidney with apparent wire loop lesion. Systemic lupus erythematosus should be treated with high dose of corticosteroid. There are a lot of symptoms and signs of systemic lupus erythematosus. These include malar butterfly rash, photosensitivity, Raynaud phenomenon, pleuritis, loss of weight, arthritis, cotton wool spots on retina, nephrotic syndrome , Libman - Sacks endocarditis, pericarditis, interstitial fibrosis,coronary artery disease, mitral stenosis, valvular vegetation and pleural effusion. Systemic lupus erythematosus may also produce false positive result for VDRL ( syphilis test). 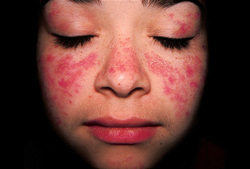 Systemic lupus erythematosus may affect the skin by destruction of the basal layer of epidermis, necrotizing vasculitis and edematous dermis. There will be infiltration of the mononuclear in the subsynovial tissue and synovitis due to the present of neutrophils in the synovial fluid. Laboratory finding may reveal the present of anti- histone antibodies, anti - ds DNA antibodies,ANA and pancytopenia.